This is a great movie that captures love, drama, song and comedy that I recommend everybody to see. 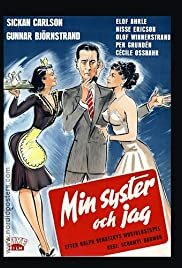 Min syster och jag is a comedy from 1950, that is about a wealthy woman named Catarina Hassel that lives in a mansion. She hires an architect named Gunnar Stenwall to restore her mansion, flames starts to appear between them but Gunnar thinks that she is too "Modern" and only out with her wealthy friends partying and drinking all night but she dont give up that easily.